Portable Thermal Fogger – Engineered With the User in Mind. Dyna-Fog Trailblazer is designed to dispense both petroleum and water-based products easier and more efficiently than other applicators. For simple starting and operation, the Trailblazer features Dyna-Fog’s patented 12 volt electric start- ing system to assure reliability, effectiveness, fuel efficiency and ease of operation. No pressurized gasoline tank required! 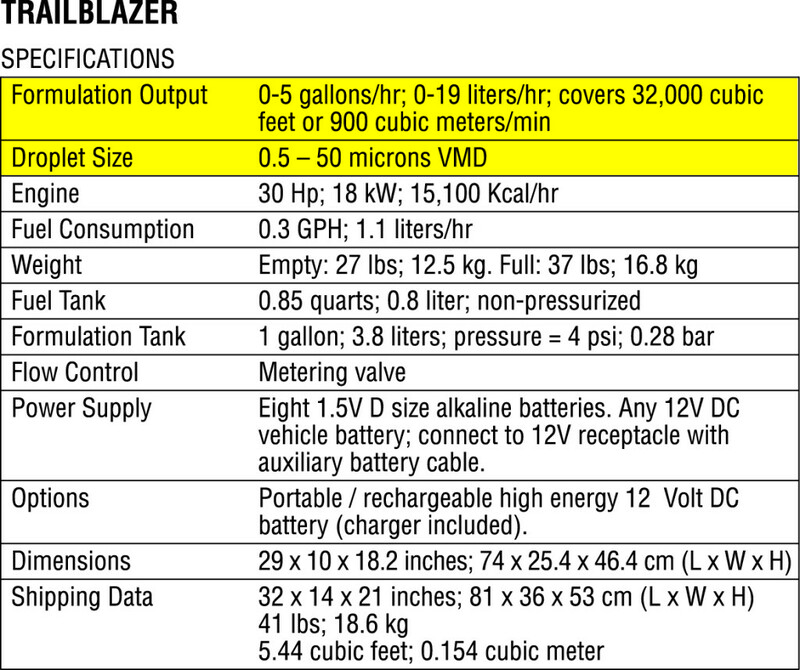 The Trailblazer produces a high output, non-residual thermal fog with virtually no carbon monoxide, making it ideal for applications such as: dispensing fungicides, insecticides, germicides disinfectants and odor counteractants for application in greenhouses, warehouses, factories, food processing plants, parks, campgrounds, cattlebarns, swine/poultry houses, grain mills, restaurants, hotel complexes and much more. The Trail- blazer is also used by Health Ministries throughout the world for controlling mosquitos that transmit diseases like West Nile Virus, Encephalitis, Malaria, Dengue Fever, Yellow Fever and Chagas.